Out standing in his field, or rather, future hazelnut orchard: Ted Bender. 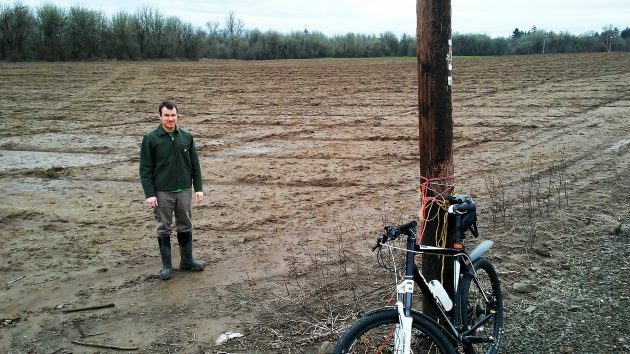 One of my bike routes takes me along Bryant Drive outside of Albany, where filbert orchards are taking over acreage that used to grow grass-seed and wheat. 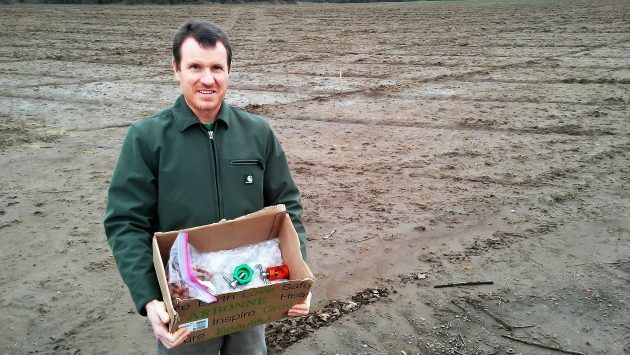 In one of those fields, Ted Bender is planning to start his own hazelnut operation, and he’s going about it in an unusual way. Bender, 41, is a machinist at Wah Chang, or ATI Millersburg as it’s been known for a few years. He grew up on his family’s place on Bryant Drive and still lives nearby. During summers of his high school years he enjoyed working on a farm. Now, looking far into the future, he’s planning to plant a filbert orchard of his own. And he launched a Kickstarter campaign to help defray the cost of planting close to 5,000 trees. Bender with a bag of filberts and samples of the nutcrackers he has designed. The campaign has a stated goal of $60,000 by March 31. Bender is offering ingenious-looking nutcrackers of his own design to people making pledges. As of Friday afternoon, three days in, the campaign had 24 pledges totaling $1,995. There’s a video with spectacular drone footage and Bender explaining the virtues of planting trees and eating nuts. You can see it here. On a ride Friday, I met Bender at his future orchard. He plans to start with 24 acres and then plant an adjoining 18 acres. The trees will be 10 feet from each other in rows 20 feet apart. Then, years from now, he says, every second tree will be uprooted to let the rest get bigger and more productive. How did all this come about? At my request, Bender put the story down in an email. “I will tell you about what I am doing,” he began. “I worked on a farm during the summers of my high school career and really enjoyed it. I have always remained friends with the farmer and his family and he suggested when his lease ran out on the land he leased from my mom that I plant filbert trees to make some extra money and have something to do for retirement. “About 30 years ago I remember my dad making a nutcracker with his welder. Fast forward 30 years and I thought I would try to come up with a few more unique designs. Then my brother Pat suggested I try selling them on Kickstarter. I came up with the idea that if someone buys a nutcracker they will help me plant a tree… I thought planting the orchard would be a great idea and in another 20 years, when I am ready to retire, it will be a well established, producing orchard. Some people invest in the stock market for retirement; I thought I would invest some of my money in growing an orchard.